LAST GAME 11/2/08: Buccaneers 30 at Chiefs 27 (OT). Tampa Bay WR Antonio Bryant catches 24-yard TD pass with :19 remaining to force OT, where K Matt Bryant converts decisive 34-yard FG. LAST GAME AT SITE 11/7/04: Buccaneers 34, Chiefs 31. Tampa Bay RB Michael Pittman rushes for 128 yards & 2 TDs, including game-winning 3-yard score in 4th quarter. BROADCAST CBS (1:00 PM ET): Marv Albert, Rich Gannon. SIRIUS: 136 (KC), 94 (TB). XM: 227 (TB). CHIEFS: Have won 6 of past 7 in Oct…In past 10 vs. NFC, QB MATT CASSEL is 7-3 with 85.7 rating. QB BRADY QUINN made 1st NFL appearance since 12/20/09 (w/Cle.) last wk…KC averages AFC-best 180.8 rush yards per game in ’12…In past 3, RB JAMAAL CHARLES is averaging 153.6 rush yards/game (461 total). Averages NFL-best 133.8 scrim. yds/game in ’12 (551 rush; 118 rec.). Since ’10, avg. 118.7 rush yards/game vs. NFC (831 yds, 7 games)…WR DWAYNE BOWE had TD catch in only career mtg. vs. TB on 11/2/08. Bowe (39) needs TD rec. to become 5th player in club history with 40 career…Since Week 13 of ’11 season, LB JUSTIN HOUSTON is tied for NFL-best with 11.5 sacks (JARED ALLEN). LB TAMBA HALI will play in 100th career game. Has 3 sacks in past 2 games…CB BRANDON FLOWERS aims for 3rd consec. game w/ INT…BUCCANEERS: QB JOSH FREEMAN has won 4 of past 6 starts in Oct. Since 2010, is 1 of 2 QBs with 7,800+ pass (7,833) & 600+ rush (624) yds (AARON RODGERS). When Freeman has 95+ rating, Bucs are 10-4 (.714)…Rookie RB DOUG MARTIN is 3rd among NFL rookies with 247 rush yards…WR VINCENT JACKSON has 100+ yards & TD in 2 of past 3. Since 2008, Jackson avg. 18.1 yards per catch (217 rec., 3,923 yards), best in NFL (min. 200 catches). WR MIKE WILLIAMS had career-high 115 yards in Week 4, 2nd career 100-yd game. Has TD catch or 100+ yards in 3 of past 4. Williams (19.9) & Jackson (19.0) only teammates to each avg. 19+ yds per game (min. 10 rec). Since entering NFL in 2003, TE DALLAS CLARK has 50 TDs (incl. playoffs), 3rd most by NFL TE…Club’s rushing defense is 4th in NFL (73.8 yds per game). 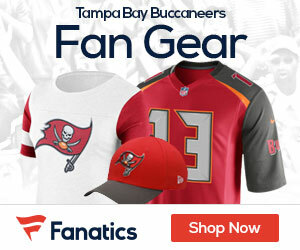 Buccaneers tie for 2nd in NFL in red zone defense with 28.6 TD pct. (14 poss, 4 TDs allowed). TB has 6 different players with INT. DB RONDE BARBER is only player in NFL annals with 25+ sacks (28) & 40+ INTs (44). DE MICHAEL BENNETT has 3 sacks in past 2 & has 6 sacks in past 7 games. LB MASON FOSTER leads team with 36 tackles followed by 2 rookies: LB LAVONTE DAVID (33) & S MARK BARRON (27).